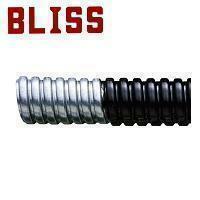 Liquid Tight Flexible Metal Conduit - Low Smoke Halogen Free (LSHF) - BS TYPE(U2017) - Bliss Yih Enterprise Co., Ltd.
Use for the place with poor ventilation or public safety is of concern for electrical, such as hospitals, shopping malls, underground railway, etc. Light weight style, excellent flexibility, low fire hazard, low smoke density and halogen-free. Use for the place with poor ventilation or public safety is of concern for electrical, e.g. hospitals, shopping malls and underground railways. Temperature range: -40°C ~ +80°C.